since you guys seem to like my recipes (thank you so much for so many likes on my Apple-Streusel-Cake recipe!) I decided to let you know another one that I really enjoy. It’s a spinach and goatcheese quiche, which you can either make a vegetarian version of or add some ham cubes – whatever you prefer! 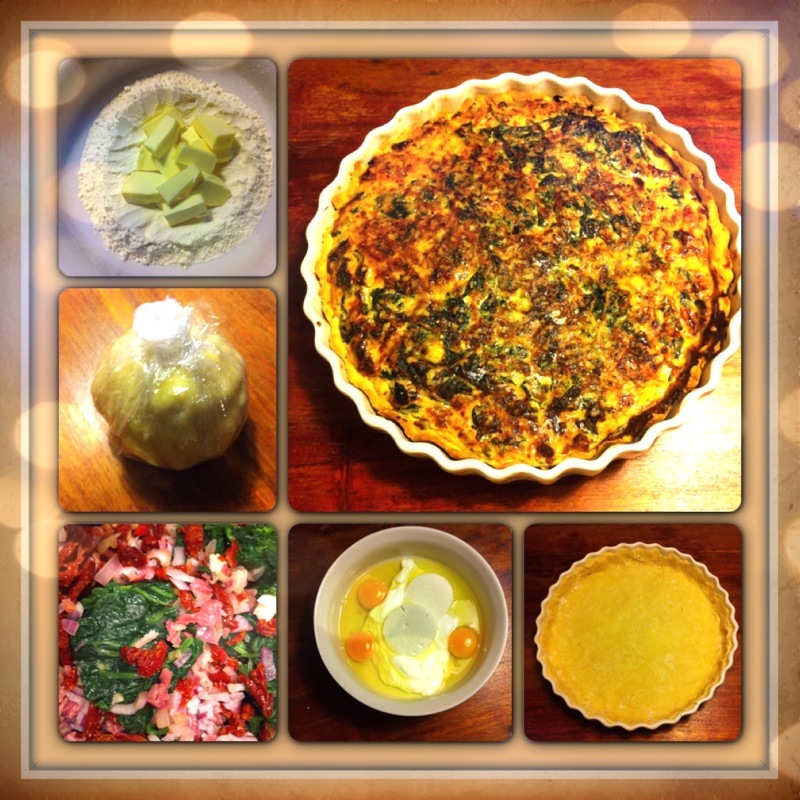 Actually, last weekend was my first time ever making this specific quiche. I was invited to a good friend’s birthday party (with a potluck dinner) and brought this. By the end of the night it was completely gone – so I guess people liked it 🙂 Here we go! Making the dough is pretty simple. Put the flour with the salt in a bowl, and place a little “hollow” in the middle. In there, you pour the water and place the butter (if it is still a little hard, it’s best to chop it into little pieces). Now it’s time to use your (clean) hands: knead the dough like it’s your job! 🙂 The more loving, the better 🙂 After everything is well kneaded together, form a big scoop, wrap it into some plastic wrap and place it in the fridge for about 30 minutes. Now we’re starting with the fun part. Chop up the onions, squeeze or chop the garlic and braise the two lightly in a pan with about a tablespoon of butter. If you like meat in your quiche, add the ham or bacon as well. Add the spinach, the (chopped up) dried tomatoes, toss everything well and then turn off the heat. In another bowl, mix the eggs, sour cream and goat cheese and stir it to a smooth creamy consistency. Add some freshly ground pepper, salt and nutmeg. Add the mixture to your other ingredients which are sitting in the pan. Roll out the dought on a floured workspace. Grease your quiche-pan (which are traditionally made of white porcelain and have a wavy rim) or – if you don’t have one – a round springform or any type of baking dish. Put the dough into your pan and press it on to the inner rim as well. Pour the mixture from the fryong pan into your baking dish and create a smooth surface (any spinach leaves peeking out too much might get burned in the oven). If you like, sprinkle some cheese on top (goat cheese, grana padano, fresh gouda… whatever you like!). This is not a must though. Put your quiche into the preheated oven (180° C, 360 ° F), if your oven lets you chosse, use bottom heat only. My oven does not have that option though, so I used top and bottom heat and covered my quiche with some aluminum foil as soon as it started getting too browned at the top. Bake it for about 30 minutes, take it out and let it cool for a while. In my opinion, quiche tastes best when it’s only lukewarm. Cut it up like a cake and serve with a glass of white wine! I hope you like this 🙂 Bon appetit! My favourite apple-streusel cake – perfect for fall! 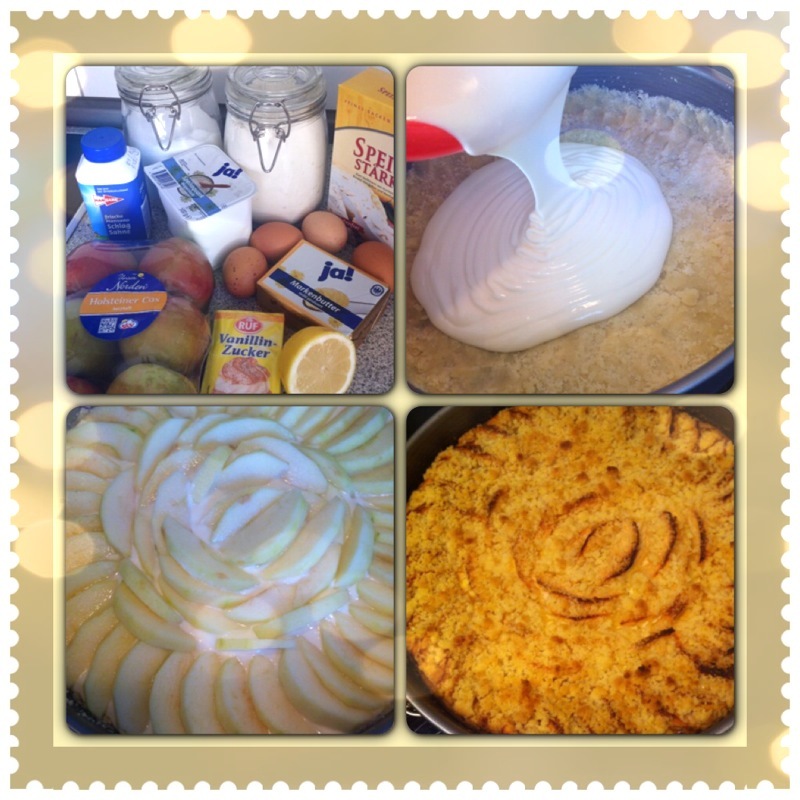 Here’s the recipe for my favourite apple-streusel cake – so yummy! Have fun! Mix 300g of flour, 150g of sugar, 200g of butter, 1 package (= 8g) of vanilla sugar and a pinch of salt. Knead with your hands. It’s supposed to be kind of crumbly! Then divide the batter, put one third of it aside and press the rest of it on the bottom of a greased 26 or 28 cm (10 to 11 inches) springform baking pan. Make sure to press it a little bit up the rim as well, about as high as a finger or two. It’s now time to preheat your oven to about 180 degrees celsius (360 fahrenheit) with circulating air. Mix 250ml of cream, 500g of low fat quark (curd cheese), 100g of sugar, 2 eggs, 40g of starch, 1 package (= 8g) of vanilla sugar, and one tablespoon (or a little less) of fresh lemon juice. Stir well, then pour the filling into the springform which you’ve already prepared with two thirds of the batter. Slice up about 800g of apples. Hard and kind of sour ones are best for baking (the best ones you can buy in Germany are Jonagold, Cox Orange, or Boskop). Spread the appleslices on the cake. Then add the rest of the streusels – which you’ve set aside earlier – evenly on top of the cake, et voila, you’re done! Let me know if you like the cake! Happy fall everyone! Today I would like to share a yummy muffin-recipe with you guys, those are perfect for a sunday afternoon with coffee and family or friends! Preheat you oven to 180° C (356° F). Prepare a muffin tray with paper cups. Mix the flour, baking powder, baking soda (natron), cocoa powder and cranberries in a bowl. In a second (bigger) bowl, whisk the egg with the sugar, oil and joghurt (or buttermilk). Then add the mix from the first bowl (the flour etc) to the bigger bowl and stir it all together. Fill the dough into the paper cups and let it bake for 20-25 minutes. I didn’t decorate mine, but I could imagine making a frosting out of powdered sugar, cream cheese and some cranberry juice… Let me know your thoughts! I first chopped 3 small onions, 2 cloves of garlic and a big piece of ginger. The size of the chunks is not important as you will purée everything lateron. Lightly brown these in a big pot with a good amound of oil or butter. Then add chopped carrots and potatos (again, the size doesn’t really matter). I used 5 big carrots and 5 big potatoes. Let it slightly brown in the pot as well to give it some flavour. Then pour about 1 liter of vegetable stock into the pot and let everything cook until the veggies are soft. Meanwhile, shred the peel off of one (organic!) orange and queeze the juice out of it as well. Add to the soup, then blend everything with an immersion blender. Add freshly ground pepper and a scoop of sour cream if you like et voilà, your soup is ready to be served! Guten Appetit!